The New Millennium Observatory (NeMO) is a seafloor observatory at Axial Seamount, an active underwater volcano located about 250 miles off the coast of the northwest United States. The observatory studies the relationships between submarine volcanic activity, the chemistry of seafloor hotsprings, and the biological communities that depend on them. 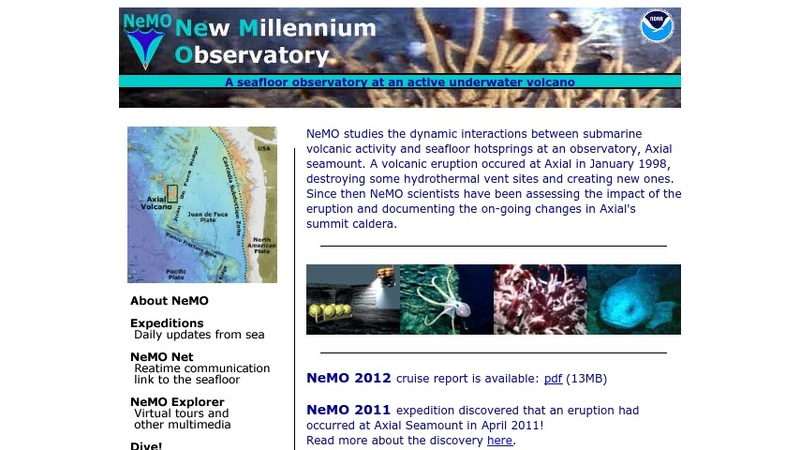 Materials available at the NeMO web site include updates from observatory expeditions, videos and animations, and an interactive feature that lets users pilot a simulated remotely operated vehicle to explore the seamount. The NeMO curriculum page features a unit, with activities, in which students investigate a swarm of small earthquakes and the disappearance of an instrument. A volcanic eruption occurred at Axial in January 1998, destroying some hydrothermal vent sites and creating new ones. Since then NeMO scientists have been assessing the impact of the eruption and documenting the ongoing changes in Axial's summit caldera.